Photographer Jason Laboy recently captured this Game of Thrones cosplay jamboree in New York’s Central Park, and not only did it feature a whole lot of swords, but a ring as well. First, the cosplay! And when I say the shoot involved “everyone” from the show, I’m not kidding: most of the Stark family turned up, as did some Wildlings, the Clegane brothers, Daenerys and her crew and one hell of a Cersei Lannister. 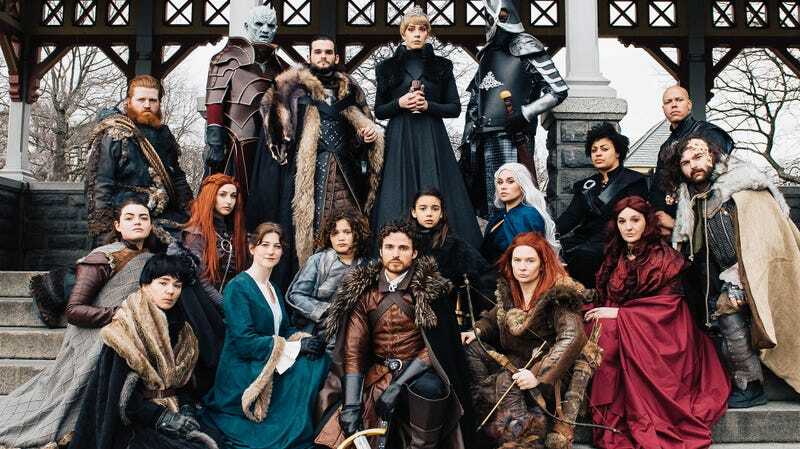 The cosplayers involved were *deep breath* Casterly Fox (Cersei), Sutton Family Cosplay (The Mountain, Lady Lyanna Mormont & Meera Reed), Loren Omer (Catelyn Stark), Sparrow Song (Arya), Odd Freya (Bran), Jesse Bonelli (Robb Stark), Kira Kelly (Sansa), imdrawingablank (Melisandre), Khaleesibeth (Daenerys), Andrew Campbell (The Hound), Kevin Von Close (Tormund), princessmarquet (Daenerys & Ygritte), Luis Monserrate (The Night King), Tim Snow (Grey Worm), soobutterrican (Messandie), Mathieu Archambault (Jon Snow S7), Vaios Ely Soriano (Jon Snow Night’s Watch) & Jake (Oberyn Martell). Everyone looks very mean and angry and smug when appropriate, but in the middle of the shoot character was broken when The Mountain surprised Cersei with a proposal. Maybe there’ll be happy endings in Westeros after all. All photography by Jason Laboy.